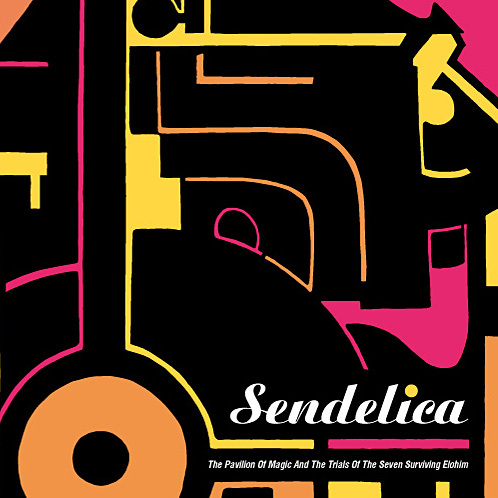 Sendelica have covered a lot of ground over several albums, and on their latest they are rocking out in space while diverting traveler-listeners to various stylistic ports of call. 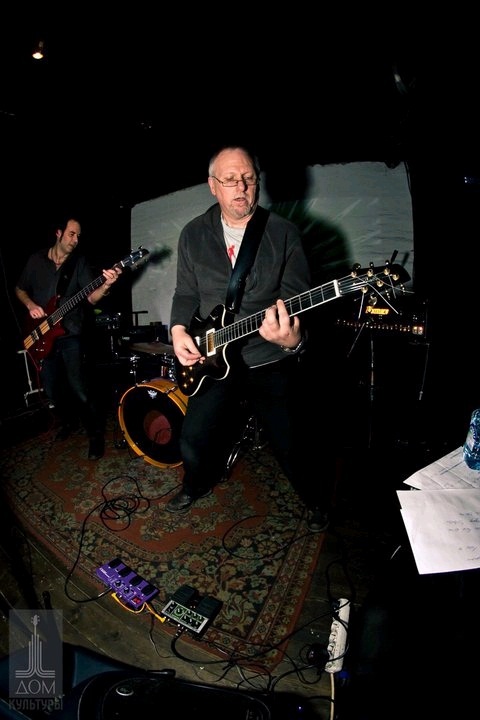 The band is still the core of Pete Bingham on guitars and electronics and Glenda Pescado on bass, plus Nick Danger on drums, Colin Consterdine on synths and electronics, Roger Morgan playing keyboards and electronics on several tracks, and a few other guests that we'll get to shortly. The album opens with Zhyly Byly, a tightly structured power-psych space rocker. I like the combination of blistering guitar licks and Reggae-ish rhythms. A strong opening track. The Elohim is next and is a 15 minute stoned, but ethereal, spaced out jam. The band trip along, Pete's guitar leading the way, with the rhythm section maintaining a steady marching beat, plus soaring, howling and bubbling space electronic embellishments. What makes this a solid track for me is that it's not only a cool spaced out jam, but Pete's guitar creates melodies that make the jamming all the more pleasant and kept my attention throughout. I'm feeling pretty mellow after that one, and Sendelica continue in a similar mood but return to the shorter and more structured song mold with Guiding The Night, a 3 minute rocker that comes across like some kind of psychedelic anthem. Just as Guiding The Night ends the band shift abruptly into the mellower but still melodic rocking Orion Delight. Arizona Spree takes us into different territory, being a drifting space-ambient-jazz piece with gorgeous sax leads by Lee Relfe. The 12 minute Banshees & Fetches follows and seems to pick up where Arizona Spree left off, continuing with ambient and somewhat jazzy spaced out themes. It jams, but in an understated laid back way, and we're treated to more cool sax soloing from Lee Relfe, which goes nicely with Pete's bubbling trip guitar. In the last minutes the band pick up the pace and take off before coming in for a soft landing. Wrapping up the set is The Pavilion Of Magic, another stoned, jamming spaced out psych rocker. But wait… there's MORE! Sendelica round out the set with two cover tunes. One is the Velvet Underground's classic Venus in Furs, which Sendelica originally released as a vinyl 7" on the Fruits de Mer label (backed with a cover of Funkadelic's Maggot Brain). This is a nice cover of Venus in Furs, with Alice Davidson's vocals giving the song a distinctly non-Velvets character. Traversing to the other side of the universe, Sendelica follow this with a cover of Captain Beefheart's This Is The Day (which I believe was on the Captain's Unconditionally Guaranteed album). The band give the song an acoustic-ambient treatment, with excellent (un-Beefheartian) vocals by Molara and flute by Nik Turner. Note that in addition to the normal CD issue of the album there is a 100 copy limited edition CD/DVD that includes the new Sendelica movie Ritual. The first section of the following interview was from an all Sendelica special I did for Aural Innovations Space Rock Radio in March 2010, in which Pete and Glenda sent me recorded answers to questions that were played between tracks througout the show. There was good general information and band history in that so I transcribed their responses for publication in this article. This is followed by a more recent email interview that brings us up to date on Sendelica's activities. Aural Innovations (AI): How long have Sendelica been together and tell me how the band came about? 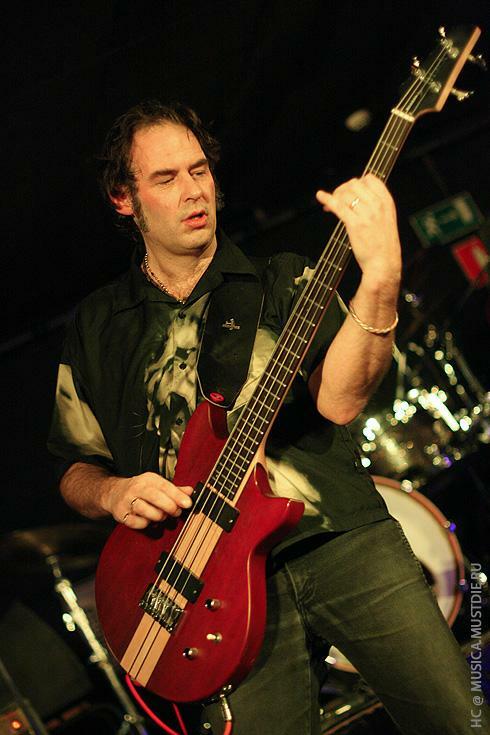 Pete: Well I guess the first idea of the first germs of Sendelica came about when I saw Acid Mothers Temple playing a gig in 2006, and it really reminded me of the music of my youth that I loved so much. I thought it would be great to put a band together that played that kind of music. So basically I just got a few people together to jam on Sunday afternoons. A few people came into the group, a few people left the group. A friend of mine, Colin (who eventually became Sendelicas producer and then a member), gave me Glenda's telephone number one day and I gave him a ring and asked if he'd fancy coming down and having a jam, which he did and we had a really fantastic time. We both had very similar reference points for music in our jamming. And I guess it was at that point that Sendelica was really born. Glenda: Basically I got a phone call from Pete one day saying that he had this idea and had a couple of musicians and did I fancy coming along and having a bit of a play. Which is what I did and we had a fantastic afternoon. And it became very clear very quickly that we had something going on there. And that's where it started. Obviously it evolved from there, with various people coming and going. But that was how we got started. AI: Your music has a great jamming quality to it. Is it all improvised? How do the tracks on your albums typically come together? 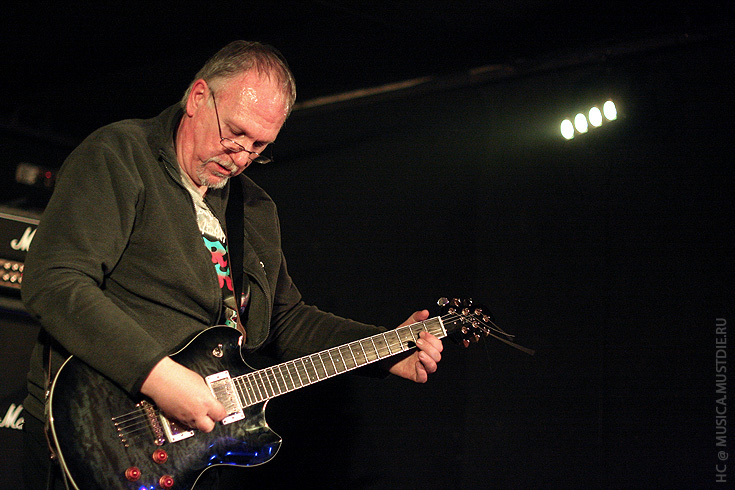 Pete: The whole idea of Sendelica was really based around a band improvising music. Although having said that, as the band has moved on we seem to have two threads of writing material. Albums such as Spaceman Bubblegum and The Girl From The Future and Streamdelica are definitely based on tracks that we've jammed around. They came about during rehearsals and writing sessions where we basically bring in some riffs, and we jam around them and the songs develop around that whole way of playing. Then we have the other albums, things like Sleepwalker Fever and The Alternative Realities are albums where I begin the process of the album by making guitar loops and actually recording them, adding electronics, a lot of overdubbing, and then other people come in and work on the tracks. So we do have two threads but both threads are definitely improvisational music. That's the one constant and probably the big string that brings all the Sendelica albums together. As far as live performance goes we do play music from our albums, but they evolve and change from gig to gig. Tracks such as Manhole Of The Universe, we have a beginning and we have an idea of where we're going in the middle, and we have an idea of hopefully where we're going to end the track. But in between those three reference points anything can happen. And that's the great joy for me and Glenda. Glenda: We jam a lot. That's what we do. Even when we've worked out numbers we never play them the same twice. I come from a very sort of jamming background. That's how I learned to play, just playing around the free festivals in the early 1980s in the UK. So that's very much my background and that's very much what me and Pete have in common, that ability to just play with each other and jam. AI: How do you view Sendelica's music? You guys can really rip it up. I was listening to Manhole Of The Universe from the Screaming and Streaming into the Starlit Nite EP, which is a monstrously rocking jam. But you can also do an album that's as mellow and meditative as The Alternative Realities of the Re-Awakening Somnambulist. Glenda: That version of the Manhole track we did. That was really exciting for us because it was the first time we'd played with Geoff. So that was very interesting because anything could have happened, and he was very much on the same wavelength as us and it worked really well. But we just play how we feel. Sometimes we feel like rocking out and sometimes we feel a bit mellower. Quite often when we're jamming away we can be dynamic, tracks can pick up and tracks can come right down, and spread out. There's no rules. Anything can happen. Pete: It's like I was saying before, we have this almost dual personality of albums we make. But the common thread that runs through all our material is that ability, and need, to improvise within our tracks. Although our roots are definitely in psychedelia and prog rock, if you want to call it that, we do have a lot of influences in our music. I listen to a lot of stuff like Massive Attack. I like a lot of dance stuff. So that always comes through perhaps a little bit more in our more meditative albums. So for me it's great that we have those two strings, that we do different kinds of albums. It keeps it really exciting for me. One great thing about the Streamdelica album is that possibly for the first time we brought those two strings together in a more coherent fashion. There's a couple of tracks on the album, and also the soundtrack to the movie, Trillian Eight, is that we were able to explore using other musicians in a much more cohesive way. For example our great friend Nemesis, who's played on a number of our tracks, has really added a great deal to a couple of the tracks with her vocals. Not in the traditional sense where you have someone come in and sing a song. But she put an immense amount of work into adding textures with her voice and adding atmospherics to tracks. It's especially apparent on the Trillian Eight soundtrack. Another great friend of ours, Virginia Tate, has added immensely to some of the tracks with her flute and guitar and organ playing. And again, it's a great contribution to the Trillian Eight soundtrack. So both me and Glenda would like to say a big thank you to these great women of psychedelic rock, and to everyone else as well who we've had the pleasure of playing with. AI: It seems like you guys play live frequently. Have these mostly been in the UK and Europe? Glenda: We like playing live. That's why we play and that's why I started playing in bands in the first place. It wasn't to make records. It was for the enjoyment of making music and playing with other people. Unfortunately we don't get to play live as much as we would like. 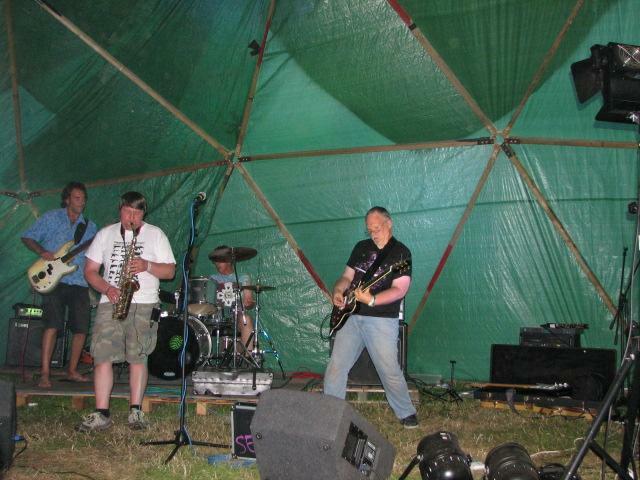 We had an amazing year last year, we did a great gig locally, the Middle Earth Festival. 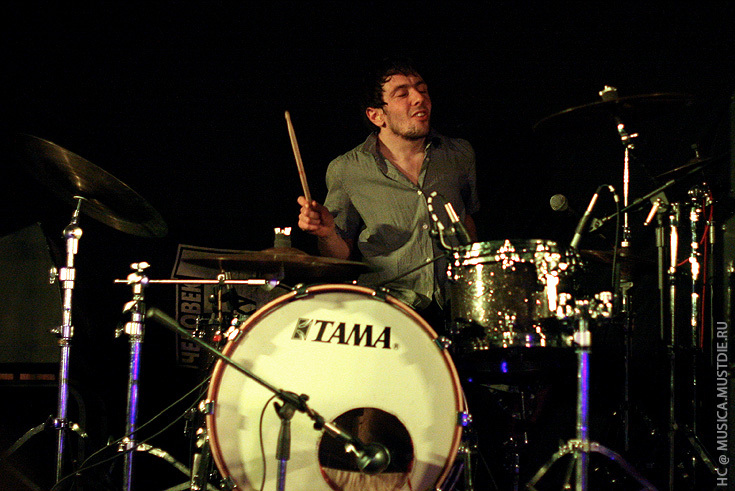 Which was actually quite special for me because... well, we've actually had a Spinal Tap succession of drummers. Drummers seem to come and go. But we had this gig booked and we didn't actually have a drummer. 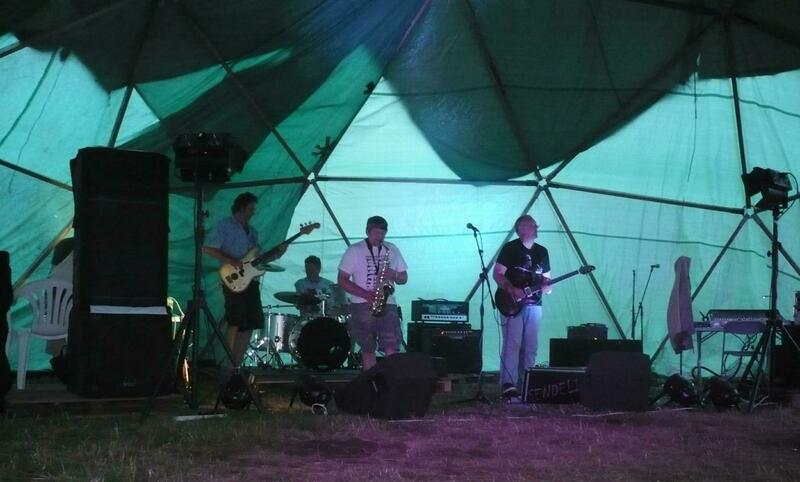 The drummer we'd been playing with had unfortunately injured himself and couldn't do the gig. So I got my youngest son Charlie, who's a very capable drummer, to sit in and do the gig with us. And he was fantastic. It went really well. And my old mate Nik Turner came and played with us as well. Which was quite nice for me because it was through Nick that I came to live in this part of Wales anyway, about 25 years ago. AI: You toured the US in 2008. Tell me about that and what kind of response you got. I believe you recorded an album while you were here too? Glenda: Coming over to America was really exciting for us. It was the first time we'd been anywhere away from home with the band. But it was fantastic. We were really well looked after. People seemed to enjoy what we were doing. And after we'd got a few gigs under our belts we had the opportunity to do some recording, which we did and I think we made the most of it. We turned up and basically played through the set that we'd been playing live, and had a couple of jams in the studio. And yeah, we got our next album, The Girl From The Future, out of it. AI: Tell me about your movie Sleepwalker Fever. I understand it was paired with The Girl From The Future Who Lit Up The Sky With Golden Worlds album. What was this movie? Pete: We've always been interested in the visual side of live shows and we've done a number of gigs with movies and lights being projected onto the band. I've always been interested in that aspect of it. Going back to the legendary Warhol-Velvets shows in the late 60s and psychedelic movies like Blow Out and things like that. Our drummer Paul, his brother, Grant Wakefield is a renowned time-lapse filmmaker, having worked with such bands as Porcupine Tree. And we approached him with the idea of him doing a few abstract film loops that we could use in live shows to project on us. At the same time we'd finished recording Spaceman Bubblegum and I'd started writing some quite ambient material, and we'd started recording an album which was to be called Sleepwalker Fever, and I gave Grant a CD copy of the tracks. But to cut a long story short he really loved the tracks and we ended up doing a movie together based around this CD of very atmospheric music, and the film was called Sleepwalker Fever. We were really pleased with the movie and it had its UK debut at the 2008 Workhouse Music and Movie Film Festival in Wales. And we showed it at a few other film festivals in Europe over that summer. And we also showed it at one of our gigs in America in Rochester, New York. The music had a CD release on the Welsh label TidyLike that year. And then we released the actual movie as a limited edition DVD with the R.A.I.G. album The Girl From The Future Who Lit Up The Sky With Golden Worlds. So it was a really interesting project and I'm really pleased with the outcome of it. AI: How about the movie Trillian Eight? Pete: Well our interest in the multimedia side of music has really increased over the last few years. And sometimes it's viewed as a double edge sword. I think our music is very evocative and puts images in people's heads. But at the same time it also lends itself very much to being incorporated into movie projects and multimedia projects. So after the success of Sleepwalker Fever it just seemed natural that we would do another movie of some type. And in the summer of 2009 we shot a follow up to it with another filmmaker named Craig High. I don't really want to go too much into what it's about. It involves a lot of the magical places near where we live. There are a lot of stone circles, burial mounds and monolithic chambers. It's about the magic, or the feelings that they evoke when you're inside them. That they are possibly a gateway to other things. Anyway the movie is called Trillian Eight and was released last year as a DVD with our R.A.I.G. album Streamedelica, She Sighed As She Hit Rewind On The Dream Mangler Remote. AI: Spaceman Bubblegum was my introduction to Sendelica, but you had some earlier albums that I understand got minimal distribution but these are now available as digital downloads. Pete: Yeah, we released two CD's on our own label, FRG Records, before we got involved with R.A.I.G. and TidyLike. The first one was an EP called The Owls Have Eyes, which if memory serves me I think we made 30 handmade copies. So there's one to look out for. And the second one was our first album which was called Entering The Rainbow Light, which again, I think we probably made less than 50 copies of them. Glenda: Well everybody's got to start somewhere. We started out just playing with no real plan. And as you do when you're in a band you start recording some of your stuff. We wanted to make a CD available so we pretty much did it ourselves. We started out with the EP and then did a full album. And it was after that when things started picking up a bit that we came to the notice of R.A.I.G. in Moscow, and things just went from there really. AI: Your newest album is The Pavilion Of Magic And The Trials Of The Seven Surviving Elohim. This strikes me as possibly being your most varied album to date. When we did the Sendelica radio special and interview last year we got into talking about the heavy jamming vs. ambient sides of Sendelica. This album has the lengthy heavy jams, shorter and more tightly structured rockers, and more ethereal, spaced out and even jazzy instrumentals. Pete: I think this was quite a different album to its predecers in many ways. There was a lot more pre-production from the point of view of writing. Tracks like Arizona Spree and Orion Delight were almost fully formed before we went into the studio which is quite unusual for us. Zhyly Byly and Guiding the Night were also quite structered in parts. So I guess it was probably the most structured album we have recorded. Of course the album still has a considerable amount of improvising. The Elohim, Banshees and Fetches and The Pavilion of Magic are testament to that side of Sendelica... a joyous and free interplay of musicians. We were very happy with the way the album panned out. AI: I like the way you arranged the flow of tracks on the album. It was interesting to read Ian Abrahams' review in which he found the final track, The Pavilion of Magic, to be a bit unsettling after the mood he enjoyed that proceeded it. Of course everyone is going to perceive and digest these things differently. But I like the way the album starts off with rockers and jamming, then creates the mood that Ian enjoyed so much, but then ends the main set with the stoned, jam rocking Pavilion Of Magic. I guess I liked you shaking things up a bit by transitioning back to something heavier for the finale. Having said that, what were your thoughts in terms of how you arranged the tracks on the album? Pete: Yes I did smile at Ians comment because when I arranged the order of the album that was exactly what I was trying to achieve. I love music to take you on a journey. The succession of Orion Delight into Arizona Spree and then into Banshees & Fetches is an almost ethereal journey. It is almost ambient psychedelia. It is quite a contemplative and beautiful segment of the journey and the track Pavilion of Magic takes us somewhere else... quite a flight. AI: You round out the album with covers of The Velvet Underground's Venus in Furs and Captain Beefheart's This is The Day. You've made some very interesting choices of songs to cover, having also done Sendelica versions of Funkadelic's Maggot Brain and Hawkwind's Urban Guerilla. Pete: The covers scenario really came out of the label Fruits de Mer whom approached us about doing a 7" vinyl covers single last year, which ended up being Venus In Furs and Maggot Brain. What I found interesting was the 'twists' that Sendelica brought to those tracks and that was the whole point of doing them. I think we brought a great 'chill out' factor to Maggot Brain and a certain 'acid frazzled' Byrds does the Velvets twist to Venus In Furs. We also had a version of Hawkwinds Urban Guerila on the Fruits de Mer Roqueting Through Space album which we gave a bit of a 'dance' makeover to. I also love the version we did of Beefheart's This is the Day. Molara's vocals are just spine tingling and the whole 'looseness' of the track just takes it somewhere else. I think it is how Ennio Morricone would have recorded it!! There is also a 'dark-folk' version of Sabbath's Evil Woman in the vaults and we've also recently recorded a version of Amboy Dukes Journey to the Centre of the Mind, which is a great Sendelica take on a 60's freak out!! Watch this space for release details. AI: Once again your new album includes a limited run that includes a DVD of yet another new Sendelia movie, this time titled Ritual. Tell me about this film. Pete: The new movie is called Ritual and it is about the relationship we have with 'Rituals', whether on a group level or a personal level. It observes people. AI: I see you've returned to self-releasing on your own FRG label, which you released your first two albums on. Are you able to tap into the same level of distribution that you had with R.A.I.G. and TidyLike? Pete: So many aspects of music have changed beyond recognition over the last decade, including the distribution of a bands finished product. There was a time, not so long ago, that physical distribution into shops was essential and paramount to a bands success, but that is changing. Physical shops have almost completely dissappeared throughout the world. I actualy find it very sad, but you cannot deny it. Just about everybody uses the net now to buy 'entertainment', whether physical CDs/DVDs or downloads of music or film. So is the 'classical' view of distribution still integral to the process of selling music?? To go down the self release route can be quite ardorous. You need to be organised and pretty disciplined. Not only are you dealing with organising artwork and pressing but also promotion/sales/distribution. We found a great company in Scotland to deal with the pressing side of things, and the artwork was from a great company in Russia called Rushus. So that was the 'physical' side of matters dealt with. Promotion-wise we have built up a great list of connections over the years and most have been very positive and very supportive with the new album. Lastly sales!! We had already started using a company called SoundAwesome (sendelica.soundawesome.com) to facilitate our mail order sales and they have been great and I highly recommend this organization and their fees are very reasonable too and have provided a great platform for our Sendelica shop. As the reviews have begun to appear around the world some distributors have also been in touch about selling our product so it all seems to be coming together. Hard work but worth it. We are very proud of the three albums that we released on RAIG and we are/were very thankful for that venture but a change was in the air and certain circumstances dictated that we left RAIG so it seemed like perfect timing to self release again. And two months into the release I think we can honestly say it has been a very good and positive thing for us, both financialy and media-wise. AI: Speaking of FRG and the first two albums, I think you've now got them available for digital download? Pete: Yes SoundAwesome has also given us a platform to offer downloads of our early material which is great for the new fans that come aboard. All our catalogue is now available in one form or another. AI: Let's talk about the Russian tour. What dates were you in Russia and what cities did you play in? 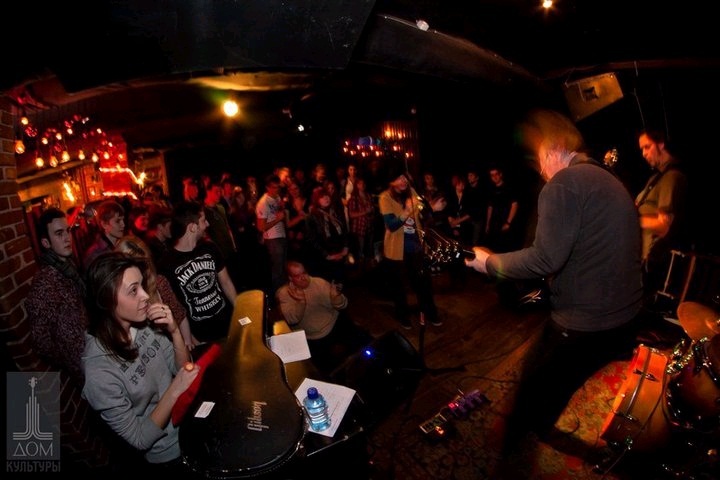 Pete: We flew from Cardiff to St.Petersburg on January 5th and were there for two weeks. We played in PSKOV, ST. PETERSBURG, MOSCOW, RYAZAN and VLADIMIR. AI: Were the shows well attended? How were the audience responses? AI: Did you get to do much sight-seeing and experience Russia? AI: You recently played at Kozmik Ken’s festival. How did that go? I saw a YouTube video with five of you on stage. Guitar, bass, drums, sax, and... it was silhouetted so I wasn’t sure... but on the left you had a keyboard/synth player who looked like he might have also had a guitar strapped on? AI: Any other recent live performances we should know about? AI: Any other news or upcoming activities you would like to share? Pete: Well there will definitely be something out on vinyl with Fruits de Mer before the end of the year. We also have a remix of Indrid Cold (Spaceman Bubblegum album) coming out on the FALLING DOWN III compilation, and possibly another surprise release. We will see. There should be another tour in eastern Europe early next year and we are also just about to start work on the next album for a 2012 release. So exciting and busy times.